Flask, the body formed of an ostrich eggshell, mounted in silver, gilded and chased. The egg is held by four vertical straps, with edges serrated and in the form of trefolils, at the top of each strap a lion mask; above, a mount with similar trefoil edging engraved with scroll foliage; circular screw-stopper, surmounted by a cupid mask, and joined to the body by two stout curb chains. Plain foot, with engraved leaf border; beneath is a medallion engraved with coat of arms, viz., a wolf rampant, crest, a demi wolf, and the date 1627 (the 27 a later addition). This object was previously owned by Carl Becker and Leo Hamburger, and collected and bequeathed to the British Museum by Ferdinand Anselm Rothschild. Origin: Augsburg, late 16th century; mark of Hans IV Miller (master 1587, died 1599). (i) Assay mark for Augsburg, 1590-5(R3 129 or Seling 20). (ii) The symbol of, perhaps, a plant with two star-shaped flowers; the punch-mark of Hans IV Miller (R3 457 where the maker is not identified and the mark is incorrectly drawn with only one star-shaped flower; see Seling 1027 for a more accurate drawing and full identification). Provenance: Collection of Consul Carl Becker, of Gelnhausen and Frankfurt; sold by auction in Cologne (Heberle and Lempertz), 23-24 May 1898, lot 152, with illus; the buyer's name was recorded as 'Hamburger'. Commentary: The maker's punch-mark has been identified for the first time in Seling 1980, p. 106, as the mark of an obscure member of an Augsburg family of goldsmiths, whose father is stated to be the goldsmith Wendel I Miller (for his punch-mark, see Seling 650). Hans IV Miller (died 1599) is recorded as being married in 1587, by which time it can be assumed he had become a master; and although he would, therefore, seem to have had a working life of some eleven years, this flask is the only known piece bearing his mark. Despite the inclusion of this mark in Rosenberg 1922 (p. 75) with a full reference to the Waddesdon Bequest ostrich-egg flask, no other piece bearing this mark has since been reported and, significantly, it was still the sole known representative of the use of this mark when it was listed in Seling 1980. Perhaps this goldsmith's short career was unproductive because of ill health, which culminated in his early demise. Certainly, the quality of the engraved and chased decoration on the marked foot is not high and shows signs of a lack of concentration. However, exactly the same characteristics are noticeable in the more complex engraved ornament on the circular mount below the neck and on the four vertical straps. His technique in all these areas is to engrave the outline of the design and then 'shade in' the pattern by horizontally engraving a series of densely packed parallel lines. As a result, the pattern contrasts effectively with the adjacent plain burnished surfaces -particularly from a distance. However, his shading often fails to stop at the outline of the design and the lines are frequently not truly parallel. The engraving on the unmarked silver-gilt medallion (fitted under the foot and joined to the base of the threaded tube vertically placed within the short stem) is clearly not entirely executed by the one hand. The better of the two hands is responsible for the helm, the elaborate mantling and the outline of the shield - perhaps this is, indeed, the same hand that engraved the foot and the mounts, for it exhibits many comparable features. It is careless in detail and lacking in precision but is surprisingly effective and assured, revealing a thoroughly deep, almost instinctive, familiarity with the sixteenth-century approach to such heraldic engraving. The second hand is responsible for both the crest and the wolf (?) rampant engraved on the shield. This second hand, with its heavy and insensitive outlines and its crude cross-hatching, is noticeably inferior. Furthermore, there are clear indications that a previous engraved device has been erased in both these areas before being re-engraved by this inferior second hand. Significantly, the re-engraved wolf (?) does not quite fit within the shield - the left leg even extending into the border over the framing circle, whilst the shield itself no longer comes to a point at the bottom. Similarly, the ears of the demi-wolf (?) in the crest break across the frame, and there is a hideous and confused jumble of engraved lines between the helm and the neck of the demi-wolf (?). This second hand is at its most incompetent in this area; indeed, the lower part of the engraved crest has seriously disfigured this armorial medallion. The date, 1627, is likewise an ill-fitting later addition, perhaps contemporary with the changes that were made to the shield and the crest. It is interesting to note that the only alteration to the medallion that was recorded in Read 1902 and in Dalton 1927 was that the 27 (in the date) was 'a later addition'. In fact, the 16 is equally unconvincing, and so the entire date could have been introduced at a secondary stage. It is impossible as yet to determine if the date 1627 represents the year when there was a change of ownership and hence the time when it became necessary to alter the original armorial bearings and, perhaps, even the encircling inscription. Whilst there can be almost complete certainty that this armorial medallion was part of the original commission carried out by Hans IV Miller (active 1587-99), because it is integral to the basic construction of the flask and to the elementary system of mounting the ostrich egg, neither of which shows any signs of alteration, nevertheless it is disappointing that no biographical details have yet been traced concerning Johan Heinrich Hibschman. Furthermore, it is not known from what source the flask was acquired by Consul Carl Becker in the nineteenth century, nor if the flask had remained in Biberbach, which is in Bavaria, until that time. The recent detailed examination of the dismantled mounts of this flask has established that, at a purely technical level, there is complete consistency throughout. All the component parts bear the appropriate scratched 'assembly numerals' (in accordance with late medieval and Renaissance workshop practice), and all the screw-threads are expertly cut and formed in the normal sixteenth-century manner, leaving the thin vertical seam still clearly visible under magnification, both in the double neck and in the base. The high standard of workmanship throughout is matched by the economy of effort so characteristic of Renaissance craftsmanship. Thus, the end of the screw-thread of the stopper, for example, has been very neatly sealed by soldering a small disc of silver over the end, whilst the upper ends of the four strap-mounts have not been cut with the border design because they were to be completely hidden under the four cast lion-mask cartouches. Perhaps the most impressive technical feature, which hitherto was presumably undiscovered since it is not recorded in Read 1902 nor Dalton 1927, is the two-tier system in the neck of the flask, by which the lower cap can be unscrewed to provide a wider aperture when filling the flask and the upper stopper can be independently unscrewed to provide a smaller aperture when pouring from the flask - a design much used for powder-flasks. If, as might be supposed, this flask was intended for a collector's cabinet - not for use 'in the field' - it is a measure of the high standards demanded by these Renaissance patrons that Hans IV Miller has designed both these caps with overlapping mouldings which sit so tightly over the rims when they are screwed into position that none of the contents of the flask would escape. The same objective must have been uppermost in Hans IV Miller's mind when he designed the circular mount below the neck and gave it the double layer of silver to fit over both the exterior and the interior surfaces of the circular aperture in the ostrich-egg shell. Furthermore, he roughened by heavy scoring both the surface of the shell around the aperture and the corresponding area on the underside of the circular silver mount - presumably to key to both surfaces some soft adhesive substance. 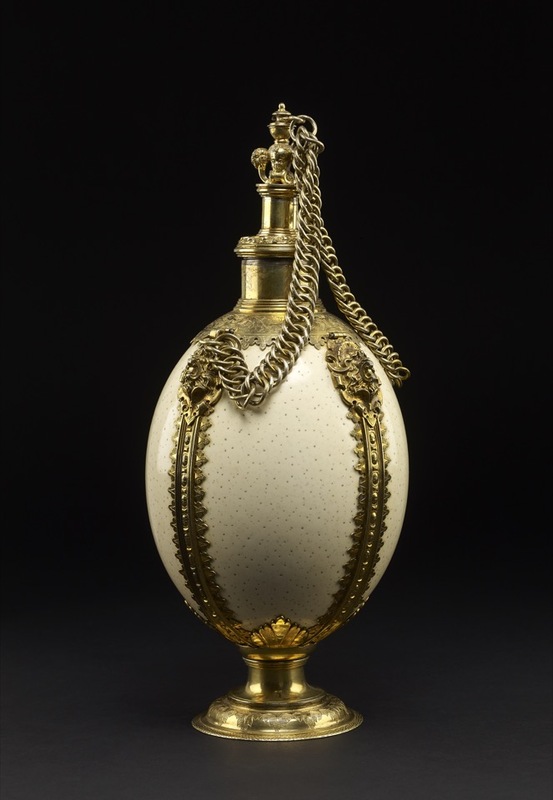 For this reason, the ostrich-egg shell has long remained in a fixed position, swivelling neither to right nor left - hence the very exact and deeply embedded stains on its surface that correspond precisely with the outlines of the silver mounts and the lack of damage around the opening. Therefore, although the flask shows little evidence of hard or regular use, the Renaissance craftsman would seem to have made it with just as much care and thought for the practical aspects as if it was, indeed, to be a travelling piece for use on a military campaign - not a Kunstkammer object for display. Indeed, its quality can be compared with the high degree of excellence that pervades the contents of the famous large travelling casket acquired in 1602 for the Elector of Saxony's Cabinet of Curiosities and now preserved in the Grünes Gewölbe, Dresden (inv. no. in. 247; see Joachim Menzhausen, ‘Das Grünes Gewölbe’, Leipzig, 1968, p. 81, pl. 43, showing a selection of the contents displayed in front of the oriental wood and inlaid mother-of-pearl casket with its silver mounts by the goldsmith Elias Geyer). One of the most relevant items in the casket is the silver-gilt and mother-of-pearl flask with its strap-mounts and silver-gilt cylindrical neck and screw-stopper. The use of the shell of an ostrich egg to create a flask now seems unique among sixteenth-century German goldsmiths' work, although four coconut-shell examples are recorded (Rolf Fritz, ‘DieGefässe aus Kokosnuss in Mitteleuropa, 1250-1800’ Mainz, 1983, nos 57, 89, 91 and 103). Of these four examples, the most relevant - and the most reliably documented - is the unmarked coconut flask in the Schatzkammer of the Deutsches Orden in Vienna (Fritz 1983, p. 98, no. 57, pl. 32a, where it is described as “South German, about 1550”; H. 22 cm). The coconut is polished -but not carved - and so is, apart from its darker colour, very comparable to the shell of an ostrich egg. The four vertical strap-mounts are the only elaborately designed elements on this piece and, significantly, the foot and stem are almost the same as those made by Hans IV Miller about 1590. Although there is only a simple fluted calyx beneath the coconut, the circular mount at the top has been given the form of four large leaves pointing downwards between the four vertical straps - a motif already noted on Hans IV Miller's flask where it was used in reverse, as part of the calyx supporting the base of the shell. The plain, short, cylindrical neck now has only a simple domed cover, and neither the existing chain nor its method of attachment is original. Similarly, the very different, but equally well-documented, Schatzkammer flask, with large mother-of-pearl sides and silver-gilt mounts and chain, which was made about 1600 by the Nuremberg master Jorg Ruel the Elder, is also not entirely in its original condition. It was first recorded in the Dresden Kunstkammer Inventory of 1640 and, later, it was listed among the items sent for repair when everything was being prepared for the 1730 installation in the newly created Grünes Gewölbe. The Court jeweller, Johann Heinrich Kohler, was paid six Talers for “viel repariret gefarbet und mit bunden Farben eingelassen worden” (see J. Menzhausen, in ‘Barock in Dresden’, exh. cat., Leipzig, 1986, pp. 368ff, no. 514, col. pl. on p. 378; H. 27.2 cm). At present, its very similar chain is no longer connected with the stopper, to which a later ring has been added above the light openwork finial of scrollwork at its apex. Repairs and alterations are rarely chronicled in detail, even in the well-regulated conditions of a grand Schatzkammer. Little wonder, therefore, that the less important collections, that often suffered more, normally have no records to account for the changes. Thus, there is no record of the major alterations that were evidently carried out during the nineteenth century on a silver-mounted ostrich-egg cup of 1609 that was subsequently bequeathed to the British Museum, the so-called Aston Tankard (Franks Bequest 1897; see Sir Hercules Read and A.B. Tonnochy, ‘Catalogue of the Silver Plate in the Franks Bequest’ British Museum, London, 1928, p. 20, no. 51, pl. xxv; also C. J. Jackson, ‘Illustrative History of English Plate’, 2 vols, London, 1911, vol 2, p. 782, with illus.). The silver-gilt mounts of this 'tankard' (H. 30.2 cm) are unmarked except for the one set of London hallmarks for 1609 (stamped on the foot) and, although his report has yet to be published, the author has concluded from a recent detailed examination that the substantial modern alterations and replacements include the silver-gilt handle and thumb-piece, the strap-mounts on the cover and the body, and, finally, the engraved mount forming the neck. Even the shell of the Aston Tankard lacks signs of wear, despite all these changes; it is probably no older than the nineteenth century. In contrast, the Waddesdon Bequest flask is strikingly free from alterations - apart from the re-engraving of parts of the armorial medallion under the foot - and its manner of mounting the shell should be compared with the famous Westernach ostrich-egg cup of 1591 - an exactly contemporary and reliably documented example that has survived in the Schatzkammer of the Deutsches Ritter Ordens (Knights of the Teutonic Order) in Vienna (inv. no. 68; see R. Sänger, Gold- und silberschmiedekunst , Bergkristall- und Steinschneidearbeiten, ‘Die Renaissance im Deutschen Südwesten’, exh. cat., Heidelberg Castle, Badisches Landesmuseum, Karlsruhe, 1986, p. 640, no. L. 43). This historic cup, bearing the arms of the Grandmaster of the Teutonic Order, Johann Eustach von Westernach (1545-1627), was made in 1591 for his residence at Kapfenburg and has remained since his death in the Treasury of the Knights of the Teutonic Order, which until 1809 was at Mergentheim and subsequently has been located in Vienna. The Westernach cup (34 cm) has typical silver-gilt and engraved mounts, including a simple calyx-like mount below, four vertical straps around the shell and a circular mount at the top of the shell, from which rises a high neck that splays gently outwards; on its rim rests a simple silver-gilt cover with a standard form of late Renaissance finial supporting a miniature figure. This excellently preserved but unmarked cup and cover can be regarded as representing the good-quality, yet simpler, kind of ostrich-egg Pokal that was so popular in the late sixteenth century in South German centres, like Augsburg, and that contrasts with the more elaborate Court versions preserved in the Grünes Gewölbe, Dresden - today, the richest Schatzkammer in this particular genre. The mounting of the ostrich-egg flask may also be compared with the equally well-documented silver-mounted ostrich egg that is uniquely in the form of a large decorative pendant and was made in 1562 for the Knight of Holy Sepulchre, Jacob Wurmser (died 1593), and was subsequently preserved in the Kunstkammer of the Dukes of Württemberg (Stuttgart, Württembergisches Landesmuseum, inv. no. KK. 129; see R. Sänger 1986, p. 639, no. L. 42). Again, the four vertical strap-mounts are very similar and bear the nielloed armorial shields that have been harmoniously applied to the centre of the straps. It is the work of a Strasbourg goldsmith, Bartel Birtsch, who had become a master in 1552 and is yet another excellent indication of the prevailing taste among the lesser nobility of Southern Germany. The Augsburg goldsmith Hans IV Miller also observed the established Renaissance convention of providing a sculptural finial for his ostrich-egg flask, but for practical reasons he chose a strong, sturdy design which would withstand the rigours of constant handling as the stopper was removed and replaced. Apart from the rubbing of the surface, his finial has survived undamaged. The use of the motif of a head facing both ways for the finial design has a long tradition and, indeed, one of the earliest surviving examples in German Renaissance goldsmiths' work is the bust of Janus on the covered silver cup, set with coins of the Hanseatic Towns, which was made in Lüneburg in 1536 by Joachim Gripeswoldt (see Klaus Pechstein, ‘Goldschmiedewerke der Renaissance: Kataloge des Kunstgewerbemuseums Berlin, Band V’, Berlin, 1971, no. 8, with illus.). Undoubtedly, the most comparable and the best-documented example of the decorative use of this type of finial occurs on the famous lobster-claw powder-flask of 2 1569, one of the 'curiosities' of the Württemberg Kunstkammer (Stuttgart, Württembergisches Landesmuseum, inv. no. KK. 19; L. 33.5 cm; see M. Landenberger, ‘Kleinodien aus dem Württembergischen Landesmuseum, Stuttgart’, Pfullingen, 1973, p. 27, with illus. ; also W. Fleischauer, ‘Die Geschichte der Kunstkammer der Herzöge von Württemberg in Stuttgart’, Stuttgart, 1976, p. 90; and A. Walz, in ‘Die Renaissance im Deutschen Südwesten, zwischen Reformation und Dreissigjahrigem Krieg’, exh. cat., Heidelberg Castle, Badisches Landesmuseum, Karlsruhe, 1986, II, p. 751, no. o. 14, with illus. on p. 752). Often known as the flask of Sebastian Schanzenbach, Abbot of the Schöntal Monastery (1557-83), because it bears his coat of arms and the date “1569” enamelled on a roundel, this unique 'curiosity' has survived unaltered, with its silver mounts bearing the punch-mark HP (for the town of Heilbronn). At the broad end (around the aperture in the shell), the strap-mounts are linked to the strong circular mount, which supports a two-tier silver construction - like that on the London ostrich-egg flask - and terminates in a narrow, cylindrical mouth and screw-stopper with a finial in the form of a winged cherub's head facing both ways. This sculptural finial is very similar to the slightly later version created by the Augsburg goldsmith Hans IV Miller. Curiously, the only documented ostrich-egg flask to have survived - and, again, there are no controversial doubts about its silver-gilt mounts - is the anonymous early fifteenth-century masterpiece from the Benedictine Abbey of Herrieden, near Ansbach, which at the time of the secularisation in 1803 entered the Schalzkammer of the Munich Residenz (see H. Brunner, ‘Schatzkammer der Residenz München’, 3rd edn of the Catalogue, Munich, 1970, p. 52, no. 18, pl. 12; also, Hans Thoma, ‘Kronen un Kleinodien’, Deutscher Kunstverlag, 1955, p. 21, pl. 19, for an excellent detail of the neck and stopper, the two kneeling angels and the strap-mounts). The Gothic goldsmith, probably French, has not mounted the ostrich egg vertically - as Hans IV Miller has done - but has cradled it on its side within curving mounts, while at the same time raising it on an elegant spreading foot. In a clever piece of design, its long chain, which is attached to the stopper, has both its ends joined to plain, strong hooks projecting from the backs of the two large kneeling angels (between the shoulders) and, therefore, the mechanics of attachment are largely hidden behind the long, descending wings. This beautiful work of late Gothic art triumphantly incorporates the shell of the ostrich egg into the overall design of the flask; oddly, the only matching achievement from the Renaissance that appears to have survived is the work of a short-lived and little-known goldsmith of Augsburg, now identified as Hans IV Miller. To the lasting credit of Baron Ferdinand Rothschild, this flask was successfully purchased at the Cologne auction sale in May 1898, and brought to England just six months before his sudden death on 17 December that year at Waddesdon Manor. Dora Thornton, 'A Rothschild Renaissance: Treasures from the Waddesdon Bequest', British Museum, London, 2015, pp.272-275.